My mother’s garden is set in the soft green hills of the countryside, it’s surrounded by high bushes and trees, spruce, birch and pine. The lush lawn winds around a curved patch of rhododendron that leads to a little pond covered with the most majestic blossoms of water lilies gently laying on top of waxy leaves. This was once the home to a school of glowing goldfish which, sadly, was discovered by a grey heron one summer. It had all started with two fish which I gave my mother as a birthday present many years ago, they must have really liked each other as it wasn’t long before their population grew rapidly. We enjoyed them a lot, it was such a perfect picturesque garden scene. I used to sit next to the roses growing at the stone steps at the water looking at the bright red fish swimming through their kingdom. But nature had a different plan. The beauty of this garden, its peace and vastness, makes it one of my favourite places in the world. To see my mother working in her vegetable garden which is spread out on a higher level, to watch her picking weeds and choosing our dinner, is such a beautiful picture that I will always carry with me. We discuss the meal and she often teaches me the plants’ names which I, unfortunately, tend to forget most of the time. 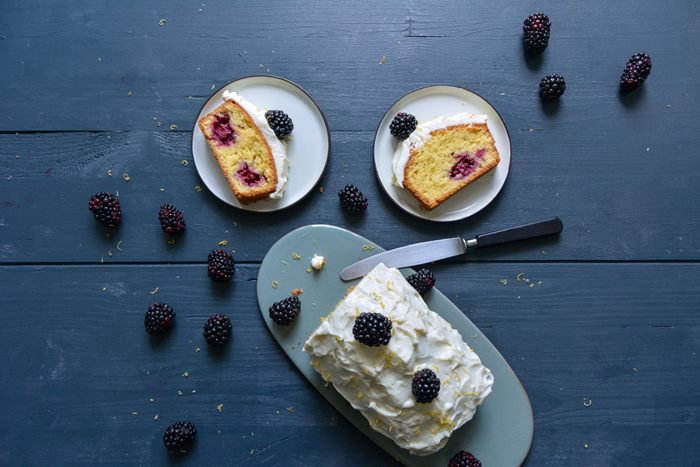 And there’s one thing that makes a day out there complete to perfection, a simple, scrumptious garden cake! 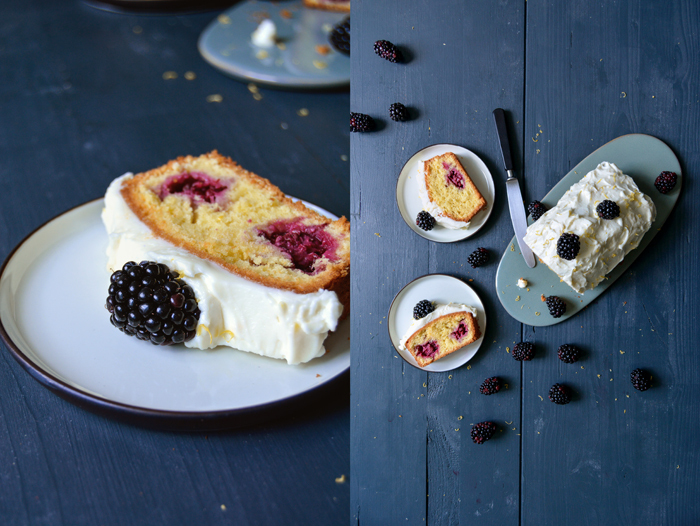 Nothing too extravagant, a pound cake is always best, with some fresh fruits (preferably from my mother’s garden) and a luscious frosting, like my blackberry cake with lemon mascarpone. It’s simple enough to eat it with your fingers while enjoying your garden on a sunny afternoon, but then there’s the creamy icing which gives it a Sunday tea time touch. 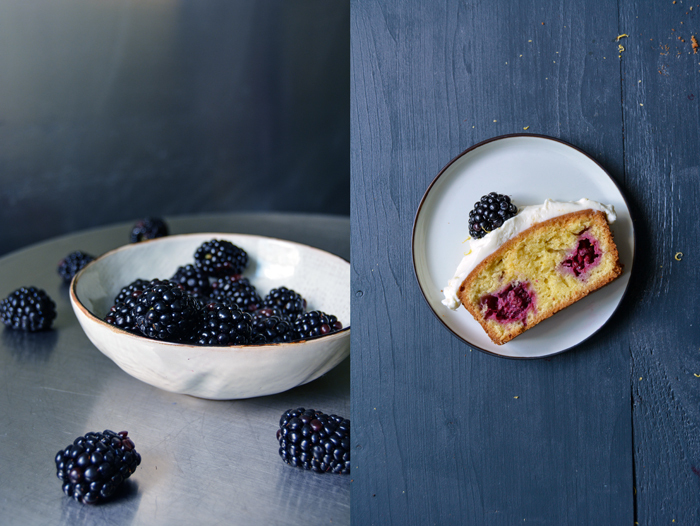 It combines everything a good cake needs in my eyes, the recipe is based on my apple cinnamon breakfast cake but the dark fresh berries turn it into a proper summer cake. Set the oven to 180°C / 355°F (fan assisted oven) and butter the loaf tin. Whisk the ingredients for the frosting and adjust to taste and desired texture. Fill in a bowl and keep in the fridge. This is enough frosting to cover the cake on its top and sides. Combine the flour, cornstarch, baking powder and salt. Mix the butter and sugar in a large bowl with an electric mixer until fluffy. Add the eggs, one at a time and continue mixing for a few minutes until the mixture is thick and creamy. Mix in the dry mixture until well combined. 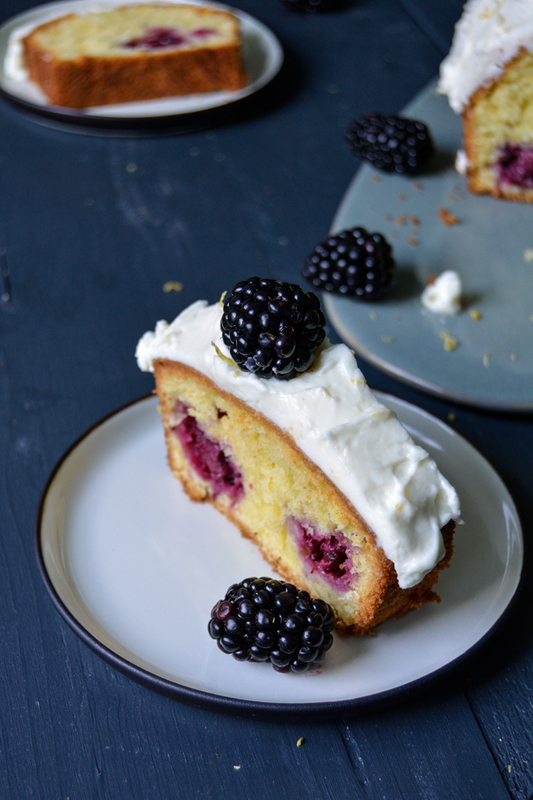 Pour half the dough into the buttered form and arrange a layer of 7-10 blackberries cut in half on top, if the berries are small you’ll need 14-20. Set the remaining berries aside. 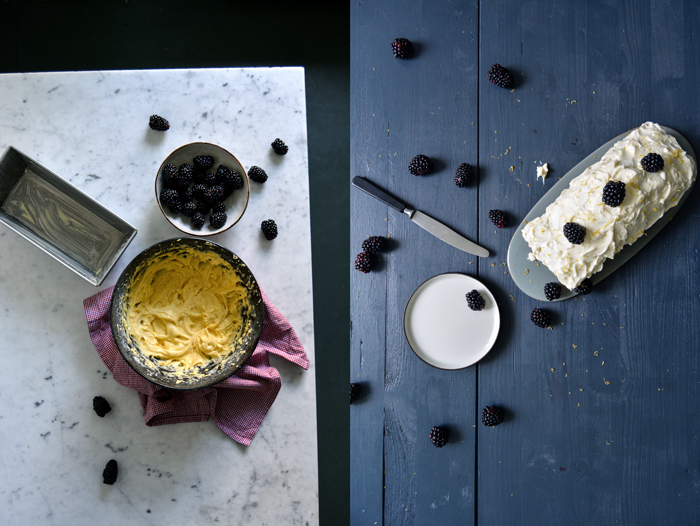 Pour the remaining dough on top of the berries, spread it out evenly and bake for 40-45 minutes or until golden on top. Check with a skewer, it should come out clean. 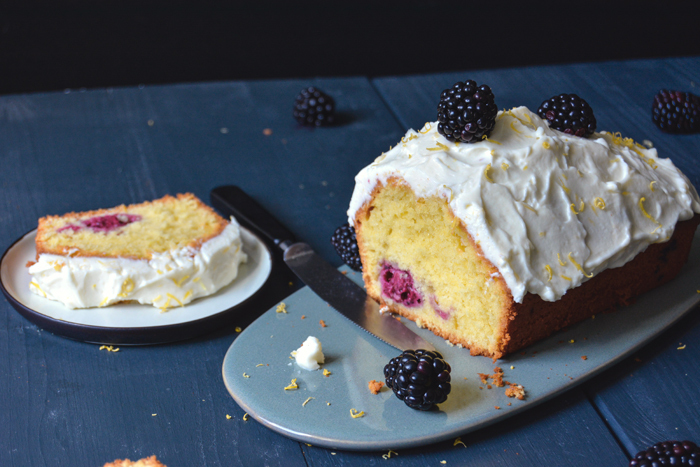 Let the cake cool for a few minutes before you take it out of the tin and lay it on a wire rack. 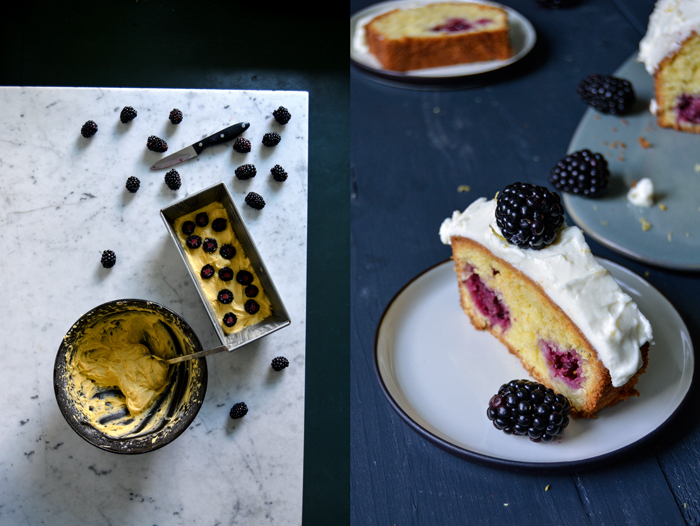 When it’s completely cool, spread the frosting voluptuously over the top (and sides if you like), garnish with a few berries and lemon zest and serve with the remaining fresh blackberries. Thank you so much Debbie! It’s such a delicious cake and I miss summer when I see it 🙂 Have a nice Sunday!